This article is about the section of Interstate 5 in California. For the entire route, see Interstate 5. Interstate 5 (I-5) is a major north–south route of the Interstate Highway System in the U.S. state of California. It begins at the Mexican border at the San Ysidro crossing, goes north across the length of California, and crosses into Oregon south of the Medford-Ashland metropolitan area. It is the more important and most-used of the two major north–south routes on the Pacific Coast, the other being U.S. Route 101 (US 101), which is primarily coastal. From SR 152 near Santa Nella to I-580 near Vernalis. This highway links the major California cities of San Diego, Santa Ana, Los Angeles, Stockton, Sacramento, and Redding. Among the major cities not directly linked by I-5, but which are connected by local highways to it, are San Francisco, Oakland and San Jose, all of which are about 80 miles (130 km) west of the highway. I-5 is generally referred to as "5" in Northern California, and is often called "the 5" in the Southern California area. I-5 has several named portions: the Montgomery Freeway, San Diego Freeway, Santa Ana Freeway, Golden State Freeway, and West Side Freeway. I-5 is part of the California Freeway and Expressway System, and is part of the National Highway System, a network of highways that are considered essential to the country's economy, defense, and mobility by the Federal Highway Administration. It is eligible to be included in the State Scenic Highway System; however, it is a scenic highway as designated by the California Department of Transportation (Caldrons) only from State Route 152 (SR 152) to I-580. I-5 begins at the San Ysidro Port of Entry from Mexico in the San Ysidro neighborhood of San Diego. Immediately after the border, I-805 splits off to the northeast and serves as a bypass of I-5 that avoids the downtown San Diego area. I-5 itself continues northwest and meets the western end of SR 905, a route that connects with the Otay Mesa border crossing. I-5 then continues northward and joins the southern end of SR 75, a highway connecting to Coronado via the Silver Strand. I-5 then enters Chula Vista, briefly leaving the San Diego city limits. It continues along the east side of San Diego Bay where it intersects with SR 54 and enters National City. From there, I-5 veers around Naval Base San Diego and reenters the city limits of San Diego. I-5 subsequently intersects with four state routes : the southern end of SR 15 (the extension of I-15), SR 75 and the Coronado Bay Bridge, the western end of SR 94, and SR 163. In addition to serving downtown San Diego, I-5 also provides access to Balboa Park from the Pershing Drive exit. The portion of I-5 from the Mexican border to downtown San Diego is named the Montgomery Freeway in honor of John J. Montgomery, a pioneer aviator who flew a glider from a location near Chula Vista in 1884. I-5 continues northwest from downtown as the San Diego Freeway until it reaches its junction with I-8, then turns slightly to the north while passing SeaWorld and Mission Bay. Thereafter, I-5 intersections the western end of SR 52 near La Jolla before entering University City. At Nobel Drive (exit 28A), the San Diego LDS Temple towers over I-5. Shortly afterward, I-5 passes through the UC San Diego campus and intersects the northern terminus of I-805 before continuing north and intersecting the western end of SR 56. At this interchange, there is a local bypass that provides the only access to Carmel Mountain Road from both directions and provides the only direct access to SR 56 going northbound. North of the San Diego city limits, I-5 enters the city limits of Solana Beach, and then three incorporated cities to the north: Encinitas, Carlsbad and Oceanside. In Oceanside, I-5 intersects the SR 78 freeway and the SR 76 expressway and continues through Camp Pendleton. It then follows the Pacific Ocean coastline for the next 18 miles (29 km). Toward the northern end of its routing through Camp Pendleton, I-5 passes through San Onofre State Beach and near the San Onofre Nuclear Generating Station. This is near the site of the once-proposed interchange with the SR 241 toll road near Trestles, a result of the planned Foothill Toll Road extension. I-5 enters Orange County at the Christianitos Road exit. Upon entering Orange County, I-5 goes through San Clemente. At Dana Point, I-5 turns inland while SR 1 continues along the coast. I-5 then heads due north through San Juan Capistrano and Mission Viejo, intersecting the SR 73 toll road heading northwest. I-5 continues to the El Toro Y interchange in southeastern Irvine, splitting into lanes for regular traffic as well as for truck traffic (though autos can use these lanes as well). From that point, I-405 takes over the San Diego Freeway designation, while I-5 becomes the Santa Ana Freeway as it runs southeast to northwest. After the El Toro Y junction, I-5 intersects SR 133, a toll road that eventually connects to SR 241. Just before the Tustin city limits, I-5 passes over SR 261, the final toll road of the Eastern Transportation Corridor, but traffic must use Jamboree Road to access the latter. I-5 then intersects SR 55 and enters Santa Ana, the county seat of Orange County. Towards the northern side of Santa Ana, I-5 intersects both SR 57 and SR 22 in what is known as the Orange Crush interchange. Following this, I-5 briefly enters the city of Orange and then traverses Anaheim, passing along the north side of Disneyland. I-5 then intersects SR 91, passes through Buena Park and crosses into Los Angeles County. After crossing the county line, I-5 goes through several cities southeast of Los Angeles, including La Mirada, Santa Fe Springs, and Norwalk. In Downey, I-5 intersects I-605, which serves as a north-south connector route between the cities east of Los Angeles, including those in the San Gabriel Valley. I-5 then passes through Commerce and intersects I-710 before entering the large unincorporated community of East Los Angeles and later the city proper of Los Angeles. When the freeway reaches the East Los Angeles Interchange one mile (1.6 km) east of downtown Los Angeles, I-5 becomes the Golden State Freeway as US 101 takes over the Santa Ana Freeway designation. At this interchange, I-10, SR 60, and US 101 intersect; I-10 continues north on I-5 for about two miles (3.2 km) before continuing east towards San Bernardino and points farther east. On the north side of downtown, I-5 follows the Los Angeles River, intersects SR 110 and SR 2 and passes along the eastern side of Griffith Park. The route continues through the San Fernando Valley, intersecting the Ventura Freeway (SR 134). It briefly enters the city of Glendale and then Burbank, passing near Burbank Airport before reentering the Los Angeles city limits and intersecting the northern end of the Hollywood Freeway (SR 170). Near the city of San Fernando, I-5 intersects SR 118. Following this, I-5 intersects three routes in succession: the northern end of I-405, the western end of I-210, and the southern end of SR 14 at the Newhall Pass interchange. It then crosses the Newhall Pass through the Santa Susana Mountains into the Santa Clarita Valley. I-5's carpool lanes also have direct connectors with the carpool lanes on the SR 170 and SR 14 freeways (an additional direct connector with the HOV lanes on I-405 near Mission Hills is planned.) This allows a continuous HOV lane to run from Palmdale to North Hollywood via SR 14 to I-5 to SR 170. I-5 continues along the western city limits of Santa Clarita and passes Six Flags Magic Mountain, intersecting SR 126 just north of there. The Golden State Freeway then rises sharply, passing by Lake Castaic and Pyramid Lake and intersecting SR 138. It then crosses the Tejon Pass through the Tehachapi Mountains, with Path 26 power lines generally paralleling the freeway. After entering Kern County, the freeway sharply descends for 12 miles (19 km) from 4,144 feet (1,263 m) at the Tejon Pass to 1,499 feet (457 m) at Grapevine near the southernmost point of the San Joaquin Valley, approximately 30 miles (48 km) south of Bakersfield and five miles (8.0 km) south of its interchange with SR 99 at Wheeler Ridge. From SR 99 to south of Tracy, I-5 is known as the Westside Freeway. It parallels SR 33, skirting along the far more remote western edge of the great Central Valley, and thus here is removed from the major population centers such as Bakersfield, Fresno and Modesto; other state highways provide connections. I-5 still runs within the vicinity of Avenal, Coalinga, Los Banos, and the handful of other smaller cities on the western edge of the Central Valley. For most of this section, the Path 15 electrical transmission corridor follows the highway, forming an infrastructure corridor along with the California Aqueduct. North of the Grapevine, I-5 intersects SR 166, SR 119 and SR 43 before meeting SR 58, a highway that continues east to Bakersfield, near the town of Buttonwillow. I-5 then intersects SR 46 before entering Kings County. In Kings County, I-5 intersects SR 41 before briefly entering the city limits of Avenal, where it intersects SR 269. In Fresno County, I-5 intersects SR 198 and SR 145 before running concurrently with SR 33 for several miles. I-5 then crosses into Merced County, intersecting SR 165, SR 152 near the San Luis Reservoir (providing a major connection to the Monterey Peninsula and the Silicon Valley), SR 33, and SR 140 at the Stanislaus county line. In San Joaquin County, I-580 splits off from I-5 south of Tracy, providing a spur-route connection to the San Francisco Bay Area. From here, I-5 intersects SR 132, a major route to Modesto and the mountains in the east, as well as the northern end of SR 33. After passing Tracy, I-5 intersects I-205, a connector route to I-580, before intersecting the SR 120 freeway near Manteca. After passing through Lathrop, I-5 heads due north through Stockton, intersecting the SR 4 freeway that provides access to downtown Stockton. I-5 passes through the western portion of the Lodi city limits before intersecting SR 12 and entering Sacramento County. I-5 enters the city of Elk Grove while passing along the eastern edge of the Stone Lakes National Wildlife Refuge. It then crosses into the Sacramento city limits, soon paralleling the Sacramento River before intersecting the Capital City Freeway, which carries US 50 and I-80 Business (I-80 Bus.). SR 99 merges with I-5 at this point, and the two routes pass through the western half of downtown Sacramento. Following the bridge over the American River, I-5 and SR 99 intersect the major transcontinental route of I-80. Just as I-5 leaves Sacramento, SR 99 splits off and continues north while I-5 turns due west past Sacramento International Airport and crosses the Sacramento River into Yolo County. In Woodland, the SR 113 freeway merges with I-5 before exiting to the north. The Interstate heads northwest again toward Dunnigan, where it converges with I-505. I-5 skirts north along the western edge of the Sacramento Valley, bypassing the larger cities of the region, including Yuba City, Oroville and Chico, before reaching Red Bluff. From Dunnigan, I-5 enters Colusa County, passing through the city of Williams and intersecting SR 20. In Glenn County, I-5 intersects SR 162 in Willows and SR 32 in Orland. I-5 then crosses into Tehama County, passing through Corning before entering Red Bluff and intersecting SR 36, which connects to the northern end of SR 99. I-5 crosses the Sacramento River twice before entering Shasta County. I-5 then enters the Shasta Cascade region, intersecting SR 273 in Anderson before passing through Redding and intersecting SR 44 and SR 299. The freeway then continues through the city of Shasta Lake, intersecting SR 151, before crossing over Shasta Lake on a causeway and climbing up to near the foot of Mount Shasta. In Siskiyou County, I-5 passes through Dunsmuir before intersecting SR 89 near Lake Siskiyou and entering the city of Mount Shasta. North of here, US 97 intersects I-5 in Weed, providing access to Klamath Falls, Oregon. The Interstate then continues to Yreka, intersecting SR 3 and SR 96 before crossing the Klamath River and reaching the Oregon border and the Siskiyou Summit. The portion of this highway from Los Angeles to San Diego was also co-signed as U.S. Route 101 until late 1964. The portion of this highway from Woodland to Red Bluff roughly follows old US 99W. In California, the former western branch of Interstate 5 (the northern end of the spur into the Bay Area) connecting Interstate 80 out of Vacaville to near Dunnigan, previously known as Interstate 5W, was renamed Interstate 505. Interstate 580 running between I-5 and I-80 was also once designated 5W; what is now I-5 (the stretch that runs through Sacramento) had been originally designated Interstate 5E. The term "Golden State Highway" was the popular name for U.S. Route 99, stretching from Mexico to Canada through the length of California. Since the construction of I-5, it has taken over the term "Golden State Freeway" from 99 south of the latter's southern terminus in Kern County. The Golden State Freeway was proposed by the California Highway Commission in 1953. The proposal drew strong criticism from East Los Angeles residents as it would dissect and eliminate large residential and commercial areas of Boyle Heights and Hollenbeck Heights. The proposal also seemed to indicate a disregard for the ethnic Mexican American population of metropolitan Los Angeles. The "Boyle–Hollenbeck Anti–Golden State Freeway Committee" was formed for the purpose in blocking or rerouting the freeway. Then–Los Angeles City Council member Edward R. Roybal chaired that committee. Despite this opposition, the construction of the freeway went ahead. When this section was completed in 1956, the newspaper The Eastside Sun wrote the freeway led to the "eradication, obliteration, razing, moving, ripping asunder, demolishing of Eastside homes." The freeway between Orange County and Los Angeles was originally designed to have three lanes on each side. Due to high demand of cars, the freeway started undergoing major extensions and widening in the early 1990s in Orange County. Work from SR 91 north through the Los Angeles–Orange County line was completed in 2010. The improvements between the county line and the East Los Angeles Interchange are scheduled to be complete by 2025. The original route went through the towns of Saugus and Newhall, and then crossed Newhall Pass (current route of SR 14, the Antelope Valley Freeway). In 1862, Beale Cut was made in the construction of a toll wagon road. The 15' wide, 60' deep (4.6 m × 18.3 m) "slot" was dug with picks and shovels. That road would become part of the Midway Route. At the turn of the century, it was the most direct automobile route between Los Angeles and the San Joaquin Valley via the Mojave Desert and Tehachapi Pass. In 1910, Beale Cut was bypassed by the Newhall Tunnel. Constructed by Los Angeles County, it was too narrow for two trucks to pass each other inside. As a result, in 1939, the tunnel was completely removed (or "daylighted") when the road was widened to four lanes. Additionally, by 1930, a bypass road was constructed to avoid Newhall Pass via Weldon and Gavin canyons, which is the current route of I-5. Both routes were eventually built as freeways. The Gavin Canyon route became I-5, and the main north-south route via the Ridge Route. The Newhall Pass route became SR 14, which is the main route between Los Angeles and the growing high desert communities of the Antelope Valley. It is also still a part of the important Midway Route, which is the primary alternate route when I-5 is closed (via SR 58 and SR 14). In the evening of October 12, 2007, two trucks collided in the southbound tunnel that takes the truck bypass roadway under the main lanes near the Newhall Pass interchange. Fifteen trucks caught fire, killing three people and injuring ten. The Ridge Route refers to the section of highway between Castaic and Grapevine, through the Tejon Pass. The highway had its origins in the early 1910s, when a route was needed to connect Los Angeles to the Central Valley. Some believed that the only option was the route through Mojave and the Tehachapi Mountains, but a new route was discovered through the Tejon Pass. This route became known as the Ridge Route and saw almost constant planning, construction, and improvement from 1914 to 1970. The first road was completed in 1915. It was a slow, winding, two-lane road through the mountains with a speed limit of 15 mph in some places. However, the need for improvements was realized soon after it was completed. The road was paved after World War I, and several blind turns were opened up ("daylighted"). Even with these improvements in the 1920s, it became clear that a new route was needed to keep up with increasing demand. In 1927, plans were drawn up for a "Ridge Route Alternate", named as it was planned as an addition to the existing Ridge Route and not as a replacement. It opened in 1933 as a three-lane highway through the mountains. The middle or "suicide lane" was used as an overtaking lane for cars in both directions. This route was a great improvement, faster and 9.7 miles (15.6 km) shorter than the old Ridge Route, but was not enough to satisfy demand, and a conversion to a four-lane expressway was needed. The outbreak of World War II delayed this until 1948 and the fourth lane was completed in 1952. However, just three years later, plans were begun for converting the four-lane expressway to a six-lane freeway. The last major alteration to the Ridge Route began in the early 1960s. By then, the plan for a six-lane freeway had expanded to eight lanes. This construction project made the most changes to the route. Many of the curves that followed the mountainside were cut through. To climb the mountain on the south side of Castaic more easily, traffic lanes were reversed (southbound lanes to the east and northbound lanes to the west). To prevent head-on collisions, the two ends of the route were separated on two different mountainsides, and the section through Piru Canyon was moved to an entirely new alignment to make room for Pyramid Lake. The project was completed by 1970 and brought the Ridge Route to its current alignment. When the Interstate Highway System was created in 1956, there was discussion about which way to route the interstate through the San Joaquin Valley (Central Valley). Two proposals were considered. One was to convert the Golden State Highway (U.S. Route 99, later CA Route 99) into a freeway. The other was to use the proposed West Side Freeway (current Interstate 5). The Golden State Highway route would serve many farming communities across the San Joaquin Valley, but the West Side Freeway proposal would bypass all the Central Valley communities and thus provide a faster and more direct north-south route through the state and so was eventually chosen. Construction began in the early 1960s. There were just three phases for the 321 miles (517 km). The first phase, completed in 1967, ran from the San Joaquin County line to Los Banos. The second phase, completed in 1972, extended the freeway south to Wheeler Ridge and connected it to SR 99. The freeway then started to see traffic, as in Stockton there were only 4 miles (6.4 km) between the West Side Freeway and the Golden State Highway. The third phase, completed in 1979, extended the freeway to Sacramento and connected it to the northern I-5. When the second phase of the freeway opened in 1972, it was a long and lonely route with no businesses alongside. Services were not easily available as the nearest towns were miles away and generally out of sight. It was common for cars to run out of fuel. Over time the West Side Freeway (I-5) saw the development of businesses serving the needs of travelers. For years, there has still been interest in designating the Golden State Highway route as its own interstate, Interstate 9. The median on I-5 between Wheeler Ridge and Tracy is wide enough to accommodate widening the West Side Freeway to six or eight lanes, should the need arise. Interstate 5's more direct Los Angeles-to-Sacramento route bypasses San Francisco, San Jose, Oakland, and the rest of the San Francisco Bay Area. Original plans also called for a loop Interstate with a directional suffix, I-5W. This route now roughly corresponds to I-580 from I-5 south of Tracy to Oakland, I-80 from Oakland to Vacaville, and I-505 from Vacaville to I-5 near Dunnigan. I-5W and most of the other Interstates around the country with directional suffixes were eventually renumbered or eliminated, except I-35E and I-35W in Texas and Minnesota. Nevertheless, San Francisco is still listed as a control city on northbound I-5 between SR 99 and I-580. Interstate 5 in downtown Sacramento closely follows the Sacramento River. This has resulted in complex engineering work to keep the section dry due to it being located below the water table. Locally, Caltrans refers to this part of the freeway as the "Boat Section". Due to record levels of rainfall in 1980 the Boat Section was flooded with 15 ft (4.6 m) of water. Caltrans began constructing this section during the 1960s and 1970s. The freeway was engineered below grade so it would be out of the view of offices and shops in Downtown Sacramento. To achieve this, the site was excavated and the seeping water was pumped from the area. An intricate drainage system, water pump and retaining wall are used to protect the freeway from the Sacramento River. However, the system slowly clogged up over the years with sand and silt buildup  Major repair work of the Boat Section began on May 30, 2008. The construction was to take 40 days to complete, requiring complete northbound and southbound closures on an alternating schedule. 74 El Camino Real Former US 101; former I-5 Bus. Interstate 5 has its own truck route, complete with its own exits, travelling through the Newhall Pass Interchange in Sylmar. The route begins near the I-210 interchange and ends near Newhall Pass. The entire route is in Los Angeles County. All exits are unnumbered. ^ Rhodes, W.T. (January–February 1951). "Montgomery Freeway". California Highways: 34–35. Federal Highway Administration (March 25, 2015). National Highway System: California (North) (PDF) (Map). Scale not given. Washington, DC: Federal Highway Administration. Retrieved October 20, 2017. ^ a b c San Diego County Road Atlas (Map). Thomas Brothers. 2008. ^ The Road Atlas (Map). Rand McNally. 2007. p. 30. ^ "John J. Montgomery". Flyingmachines.org. Retrieved November 18, 2013. ^ a b c d e f g h "2014 Named Freeways, Highways, Structures and Other Appurtenances in California" (PDF). California Department of Transportation. Retrieved June 20, 2015. ^ "San Diego California LDS (Mormon) Temple". Ldschurchtemples.com. Retrieved January 25, 2013. ^ Staff (July 18, 2008). "Truck-Only Lanes". California Department of Transportation. Retrieved July 30, 2014. ^ a b Orange County Road Atlas (Map). Thomas Brothers. 2008. 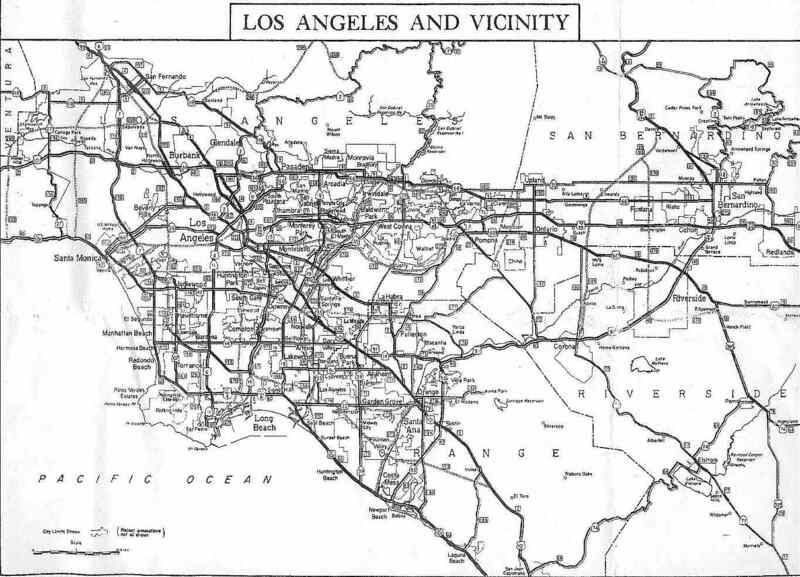 ^ a b Los Angeles County Road Atlas (Map). Thomas Brothers. 2008. ^ a b Kern County Road Atlas (Map). Thomas Brothers. 2001. ^ Kings and Tulare Counties Road Atlas (Map). Thomas Brothers. 2003. ^ a b c d e California Road Atlas (Map). Thomas Brothers. 2009. ^ Sacramento County Road Atlas (Map). Thomas Brothers. 2008. ^ a b c Chavez, Ernesto (2002). Mi raza primero! [My people first!]. University of California Press. pp. 25–26. ISBN 0-520-23018-3. ^ a b Avila, Erik (2006). Popular Culture in the Age of White Flight. University of California Press. pp. 208–212. ISBN 0-520-24811-2. ^ a b c d e f g Livingston, Jill (1998). That Ribbon of Highway II. Klamath River, CA: Living Gold Press. pp. 47–67. ^ "I-5 Closure May Last Until Tuesday". Los Angeles: WCBS-TV. Archived from the original on October 15, 2007. ^ "Investigators Advance into Tunnel after Deadly Inferno". CNN. October 13, 2007. Retrieved May 5, 2010. ^ Natzke, Stefan; Adderly, Kevin. "Economic Development History of State Route 99 in California". Federal Highway Administration. Retrieved September 19, 2009. ^ "Interstate 5 Opening Set Wednesday". Bakersfield Californian. February 27, 1972. p. 7. Starting Wednesday, Bakersfield motorists will be able to trim almost 40 minutes off traveling time to the San Francisco Bay area via Interstate 5—providing they don't run out of gas first. ^ Route 99 Corridor Enhancement Master Plan Project Development Team (n.d.). "3.5 Interstate Designation Proposal" (PDF). Caltrans Route 99 Enhancement Plan (PDF). California Department of Transportation. p. 57. Interstate designation, under the current proposal, would apply to the 260-mile [420 km] segment between the junction of State Route 99 with I-5 south of Bakersfield to I-5 in Stockton using State Route 4 as the connector to I-5. Since there is an I-99 route currently in existence in Pennsylvania, it is anticipated that should designation be granted, the Route 99 designation would become I-7 or I-9 to satisfy Interstate numbering convention. ^ a b "What Sacramento Residents and Businesses Need to Know About Interstate 5 Repairs" (PDF). City of Sacramento, California. Retrieved January 25, 2013. ^ "3.0 Project Description". Transportation Management Plan. Federal Highway Administration. Retrieved January 25, 2013. ^ Warring, KS (November 7, 2008). "Interstate 5" (PDF). California Numbered Exit Uniform System. California Department of Transportation. Retrieved July 30, 2014. ^ Teves, Jeremiah (June 19, 2018). "Long-Term Closure of Colorado Street Off-Ramp on Northbound I-5 (Golden State Freeway)" (PDF) (Press release). California Department of Transportation. Retrieved October 7, 2018. Wikimedia Commons has media related to Interstate 5 in California.